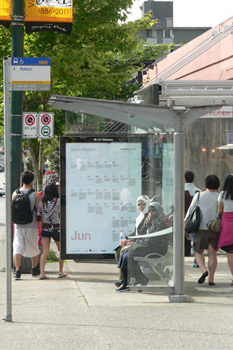 A Sign for the City was a public art project commissioned by the City of Vancouver Public Art Program with the support of Vancouver 125. In this piece, Bitter & Weber reassign the meaning of Vancouver’s “Nine O’clock Gun”. This twelve-pound cannon in Stanley Park was originally fired to signal the close of the fishing day and as a navigational aid, and has continued to be fired nightly as a symbol of the city and to mark the time. For the project, each of these daily cannon blasts was symbolically dedicated to a cultural or political figure or event in Vancouver and BC’s history, relevant to said date. The project acoustically memorializes the culture and politics that ground efforts to re-imagine Vancouver as a socially and spatially just city. In May 2011, A Sign for the City began circulating its 365 dedications in the form of monthly memorial calendars presented as transit shelter ads, full-page ads in The Georgia Straight, an edition of calendar notebooks, a twitter page, and the website link below.